Are you ready for Ella & Friends?! This is a thrilling set for us for a number of reasons! Ella & Friends is the first and only set that Angela and I literally designed together. LITERALLY, we were sitting together side by side and we drew Ella out one pencil stroke at a time. Angela started with drawing the head, I picked up with shaping the trunk, and we each took turns finishing the image. Shockingly, we completed Ella on our first try in less than a minute! This is the truest form of collaboration between us! 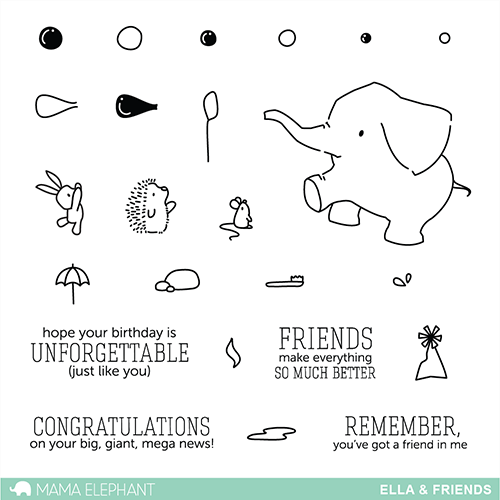 Ella & Friends is our 100th stamp set! How's that for a milestone! We've had so, so many customer requests to design a set inspired by our company name! 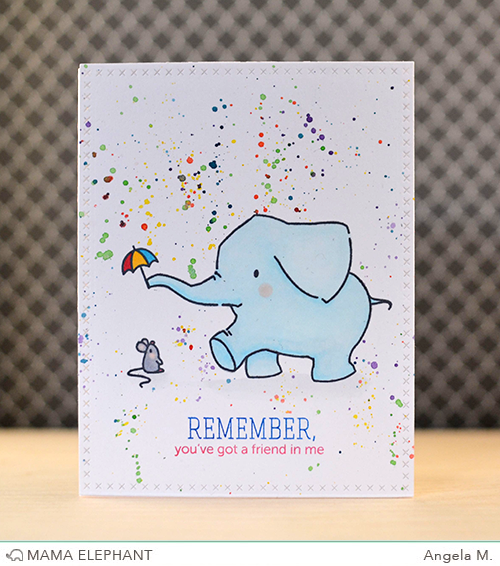 We are so happy to finally introduce Ella & Friends to you today! Ella & Friends is a super playful set. We've given Ella plenty of little friends to keep her happy. Wanna blow bubbles? Allow the little bunny on her tippy toes. Maybe Ella can use a wash -- use the towel or brush, her little friends will gladly help her get ready for the next bash! Here's my baby Ella just, oh you know, blowing some bubbles with her little buddies. Bubbles are quite fun, aren't they? Here's another -- ELLOOOOOO from Ella! She's blowing bubbles again making a mess while Mister Porcupine is trying to clean her. Yes, those bubble letters are from Balloon Letters! I've said it before, but it's worth mentioning again, we always try to design with maximum versatility in mind. When we designed Balloon Letters and Balloon Et Cetera, we purposely left out the tail end of the balloon so they can be balloons or word bubbles! To achieve the soft bubble look, I inked up my stamps, stamped it off on scratch paper first and then stamped on the card. The softness makes it look like real bubbles! Angela always loves a good story! This set includes some elements that can let your imagination go wild! We truly adore Ella and her friends! Remember to come back tomorrow as we introduce another set! Oh my goodness!! So so cute!!! Love that you have bubbles!!!! Wow how cute! You almost HAVE to get the balloon letters set now after seeing the adorable bubble letters you made. Great job!! Love it and can't wait for it to be available! Great details to go with the set.....Love the umbrella! I LOVE this set! So sweet! Wow! This is so sweet! I love the teamwork in the activities...we all need help playing & getting ready in life! So much better to do with friends! Thank you! be designing companion sets? That would be so awesome! i love this set! this is definitely a must have. just so adorable!!! Such a sweet, sweet set! Such an adorable elephant...its really cool how quickly you drew her together. You obviously make an awesome pair. I'm in love with Ella and her little friends! So sweet. Awwwww...dorable!!! Love the little Ella and all her cute friends! Oh my this set is ADORABLE! 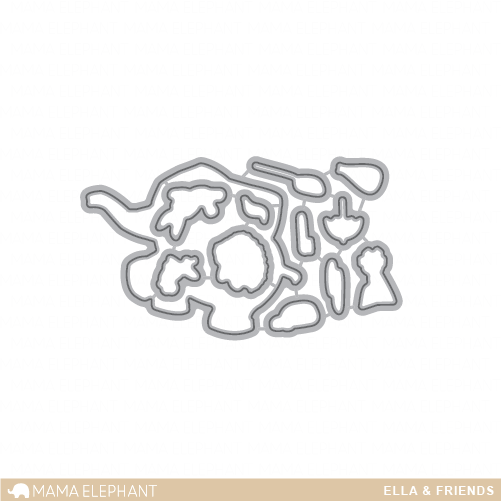 Where have I been, totally forgot we are nearing Mama Elephant's release! Ella and her friends have melted my heart! Love these sweet cards and how the illustration of this signature set occurred! So sweet! And love the bubble letters!! It only took two of you to draw this sweetie in one minute? I am so impressed! These are adorable and Ella is my new cute buddy! Oh, please, please, please make a TON (no pun intended) of Ellas! I love the collaboration concept--so cool! And thank you for creating coordinating dies! My hands thank you! Oh my, this set is so cute and the projects are really bringing Ellie and her little friends to life. I love Ella and her friends, just sooooo cute!! She would be welcome to join in my collection. Another for my wish list!! How cute. So many ideas going through my mind. I love your "first" Ella and friends! So sweet they are! What a great way to kick off a business/friendship adventure! They were the beginning of a really great thing! Thank you! I love Ella and Friends! Can't wait to order this one! Love this little guy and his friends, can't wait to get my hands on this set. LOVE this set, and I can't wait until it's available! Really cute cards, girls!!! From the Today show to now.... Well they were a bit off on their opinion, but you forged onward and upward. Love ME and all your stamps/dies etc. Amazing and awesome. So adorable, I love the other little creatures to go along with Ellie. So much cuteness in one stamp set! Most adorable set.... you ladies rock the stamping world! Ella & her friends need to come to my house- I totally love this set, think I really NEED it! CONGRATULATIONS on your 100th set - a MAGNIFICENT MILESTONE and an EXCITING collaboration - WELL DONE!!! Adorable! Congrats on this milestone! Love.this! such a sweet, sweet set. those samples are gorgeous. Congrats on the milestone. Ela and her friends are so cute! They are so sweet!! I love the little hedgie and mouse just as much and I love these soft colored cards that are amazing! Thanks, Paulette S.
So excited! Just got this set and immediately used it! My only regret is that I didn't buy the die cuts! I see another order in my future.